Nitriles occur naturally in the environment, are produced by the metabolic pathways of organisms or are released by the chemical and pharmaceutical industries, from agricultural applications or from the processing of fossil fuels. Therefore, a variety of nitrile-converting bacterial species are used to alleviate this toxic effect. 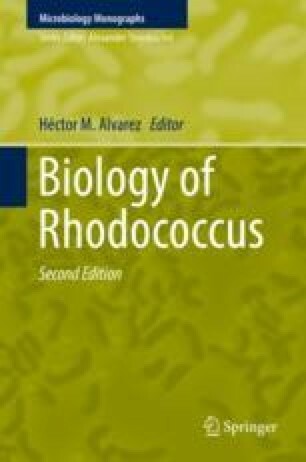 Among these bacteria, Rhodococcus species have proven to be a superior group for the clean-up of pollutants. Nitriles are converted into the less toxic carboxylic acid either by nitrilases or by nitrile hydratase (NHase)/amidase systems. Although NHases, nitrilases and amidases produced by different strains exhibit different catalytic characteristics towards aliphatic nitriles and aromatic nitriles, these enzymes exhibit considerable homology in amino acid sequence or structure. In contrast, the enzymes with different origins present different types of gene organization and regulatory patterns, although the amidase gene is always linked to the NHase gene. Due to the advantage of being resistant to toxic compounds, applications of Rhodococcus in pollutant biodegradation and biocatalytic processes are very promising. While studies on the biodegradation of nitrile pollutants focus on the screening and discovery of strains, the industrial application of these enzymes as biocatalysts focuses on engineering combined with immobilization of both Rhodococcus cells and enzymes to improve their performance under the adverse conditions in the catalytic process. Support via the projects NSFC-21776157/21476126 (the National Natural Science Foundation of China) and 973-2013CB733600 (the National Key Basic Research Project 973) is gratefully acknowledged.